St Luke's Blog: Local Business Accelerator Awards announces 2013 winner! Local Business Accelerator Awards announces 2013 winner! The Local Business Accelerators was an idea born here at St Luke's for our client the Newspaper Society, as a partnership between local papers, fledgling businesses and established business leaders to give businesses a boost with free local advertising and the support of business mentors. When 32.9 million people read a local newspaper every week, making it the most widely read print medium in Britain, it seemed like a great way to encourage both local newspapers and businesses alike. This esteemed initiative is fronted by national ambassador and Dragons' Den star Deborah Meaden and backed by Prime Minister David Cameron. 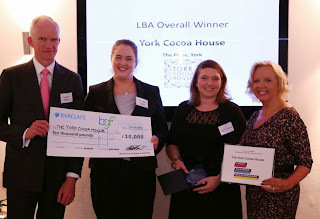 Now in its second year, the 2013 LBA Awards took place this week, where the winning business The York Cocoa House battled against 2,000 local businesses nationwide. As the 2013 LBA national winner, York Cocoa House will receive a year's business mentoring from Deborah Meaden, a local newspaper ad campaign designed by us at St Luke's and £10k cash from the Business Growth Fund.